The main quality of baroque painting is its link to reality. This is conditioned b y the persuasive interest of the Catholic Church, the advertising and political interest of the absolute monarchies and the valuation the protestant bourgeoisie made of the individual and daily activity. This link is also the result of an stylistic evolution: when at the end of 16th century the artists are aware of the purely aesthetic and counter naturalism of the Mannerism, they resource to the new, choosing that refused by the Mannerism: reality and nature. Realism. Models are found in nature, without idealisation, even reaching to naturalism. The worries about of the psychological state, the feelings, is on line with the naturalistic depiction of reality. Dominance of colour over drawing. The big masters use stains to define the shapes, as in the case of Velazquez and Rembrant. Things are painted as they are seen in the reality, with colour stains and light, loosing details and with imprecise contours. Continuous deepness. Rigorous lineal perspective is abandoned and to obtain the sensation of deepness the resources used are convergent lines, series of scorzos , an enormous foreground, a dark foreground, plays of lights and shades, plasmation of atmospheric effects. Hegemony of light. Leonardo’s sfumato is abandoned to pass to plans of light and shades where the shapes are defined with great precision. 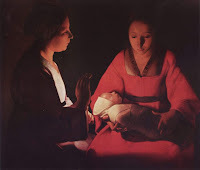 The baroque is the art of depicting pictorially the light and, consequently, the shade plays a role unknown until the moment, especially during the firs tenebrous experiments. In the baroque the shape is subordinated to the light and, sometimes, the shapes may disappear due to the feebleness of intensity of the light reflects. Freedom of composition. Asymmetric and non tectonic compositions are dominant. The instinctive trend to put the main image in the centre and to paint to halves on the canvas (symmetry) is lost. Similarly, horizontal and vertical lines combinations are abandoned (tectonic composition). The artists prefer disequilibrium or something that suggests that the scene continues further than the limits of the frame. This non tectonic composition is achieved through diagonal lines that substitute the pyramidal compositions of the former century. Sometimes broken shapes are used to indicate that not everything ends on the canvas. Worry to depict movement. 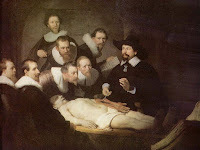 Baroque painting is the painting of the life and this can not be represented under static forms. Turmoil is put before quietness. Images are instable and scorzos and waves multiply. Sometimes that movement does not exist and the excess of calm is due to the desire of filling the image of religious transcendence. Techniques. The importance of the colour and the desire of showing it in all his splendour forces the authors to forget about the temple and oil painting and canvas are generalised, being sometimes of big proportions. Fresco continues being used to decorate walls and vaults. Subjec ts. The variety of schools results in a wide range of subjects. Religious paintings are common, as the depictions of the Virgin (Immaculate, Piety), evangelical stories, charity, sacraments (mainly Penitence and Eucharist), series about saints’ lives and their religious experiences and images of death (vanitas). 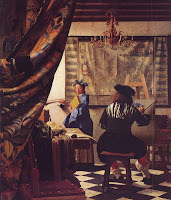 This repertoire is basic in Spanish painting. 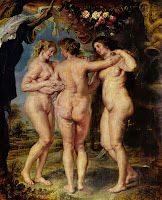 Nudes are forbidden in religious images, and they are limited to the allegories and mythologies. 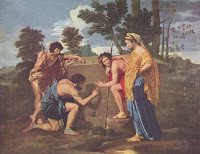 Pagan stories are common in France and Flanders. Dutch painters prefer group portrait and landscape with all its varieties: daily life images very realistic, interiors, sea-views, naval battles. Architecture can become a subject in itself, the same as still-life. In conclusion, the subject variety does not imply national specialization. Although the great development of baroque painting all over Europe is evident, Italy is again the place where the first innovations take place. There are three great currents: Classicism represented by Carraci, where the tension between naturalist realism and idealised classicism is constant. 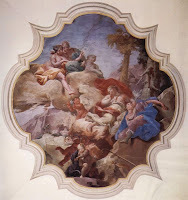 The second current is the decorative painting, that continues producing frescoes, appropriated for ceilings and vaults, with amazing celestial perspective that break the ceilings and connect sky and land. Finally, the naturalist tenebrism represented by Caravaggio, the real revolutionary of baroque painting. This author has a radical and breaking use of light that becomes a key element in the work.